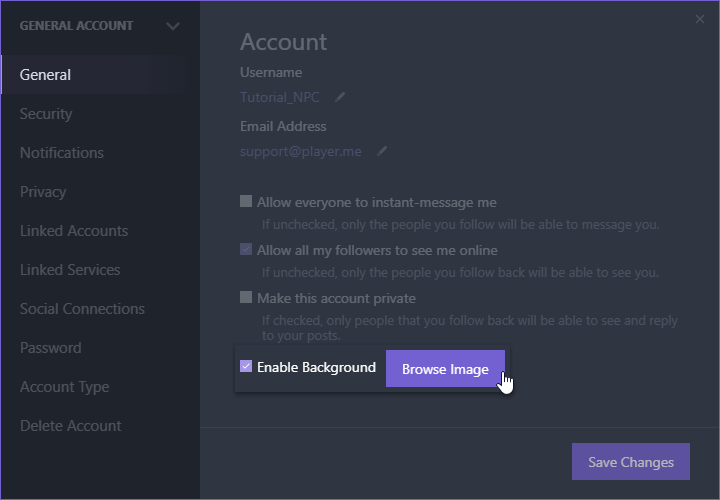 Go to Settings (by clicking the menu button next to your username), and in the General tab make sure the ‘Enable Background’ option is checked. Pressing Browse Image afterwards allows you to upload a custom background image to use for your profile. It’s best to make your background image 1410 x 470 and make sure that it’s under 1.5mb or else our system will compress it and may affect the quality of your image. To save space, it’s always best to use .jpg as the file type as they’re smaller. We also support .gif files but it needs to be under 1.5mb as well.